Center: Cotton, punch needle embroidery. 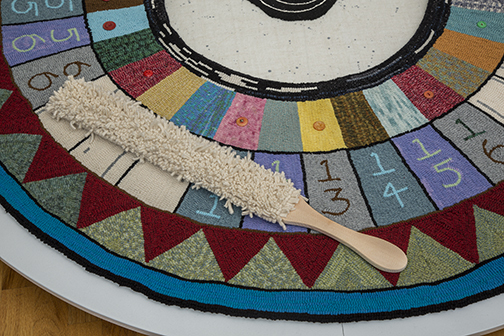 Rug: Recycled and hand dyed wool on linen, vintage buttons. Hand hooked. Sculpture: Reclaimed metal, plastic, compasses, plumb bob, string. Paddles: Cashmere hooked on linen, wood, waxed linen, ribbon. The back of one paddle is twined in waxed linen. Interactive piece where participant creates static electricity by brushing the long strands of plastic with the Cashmere paddles. The static causes the long tendrils to float in the air, almost seeming to be alive. This piece addresses the age old question of whether our paths in life are predetermined at birth, or if the decisions we make daily determine the course that our lives will take. Do we have an inner compass that keeps us on course? Why do some people always seem to make the "wrong " decisions while others are always "lucky"? Whether predetermined or not, it's a rare occasion when "everything just falls into place". "True North" is a rare moment in time when our spirits soar.